Minecraft is one of the simplest games ever in terms of graphics, a basic block game that offers so much fun to every player. The idea is to build a home and survive, gathering resources, raising animals, crops and fighting off monsters. Once a desktop only game owned by Microsoft, the game is also now available on mobile devices as Minecraft PE ( Pocket Edition ) but it does have a price attached to it. We’re going to be showing you how you can downloadthe game on your iOS or Android device completely free. Check your home screen you should see the icon and you can begin playing the game on your device straight away. If the game crashes after you start using it, it is most likely down to the app certificate being revoked. You can solve this by using a VPN on your device to protect the certificates. A VPN will allow you to download software from anywhere whilst hiding your identity, leaving you to browse and play in a secure and safe environment . Panda Helper is one of the best alternatives to Cydia that offers a huge choice of games and apps. 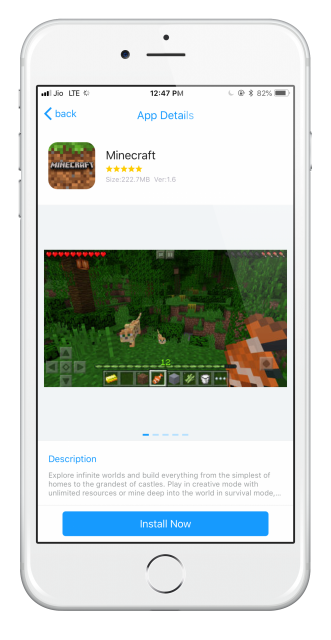 Try Minecraft PE, share your experiences in the comments box below and follow us on Facebook for more app recommendations and tips.